I can’t really hold the weather against them, but I do. Again and again I told them not to get such an early jump on the season but they ignored me and sure enough one final blast of winter came through and taught them all a lesson. Three weeks later and I’m still mourning the daffodil season which never was. Can you guess the prevailing wind direction? Like a windswept bonsai this daffodil ‘Actea’ still managed to pull through and open a few blooms in spite of the 20F winds which blew through. I shouldn’t say the whole season was a wash but if I had to guess I would say about half the daffodils lost their buds and blooms completely and only about a quarter opened up nicely. A quarter goes a long way though and I’m still grateful to have what I do, plus the weather has been very accommodating since so I suspect the surviving daffodils will put on an extra special show next year. 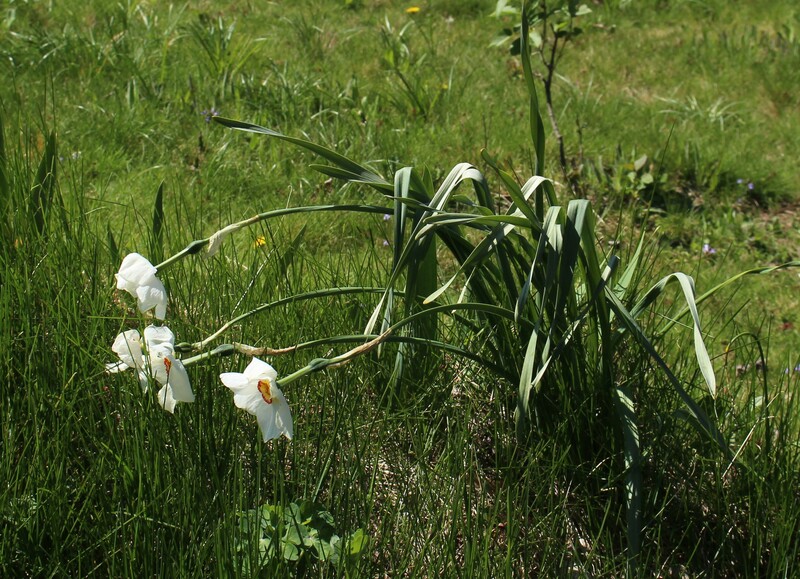 One of my many favorites, narcissus ‘stepchild’ is later and in a spot sheltered from the wind, and although neighboring clumps were still de-flowered by the cold, she seems as pretty as ever. In spite of the wild swings in temperature the various butterflies of the garden seem unfazed and continue to shake off the cold and go about their business as soon as the weather warms enough. Perhaps I hadn’t noticed in previous years, or perhaps there were other non-freeze burned sources of food available, but this year the daffodils have been very popular with several types of butterflies. 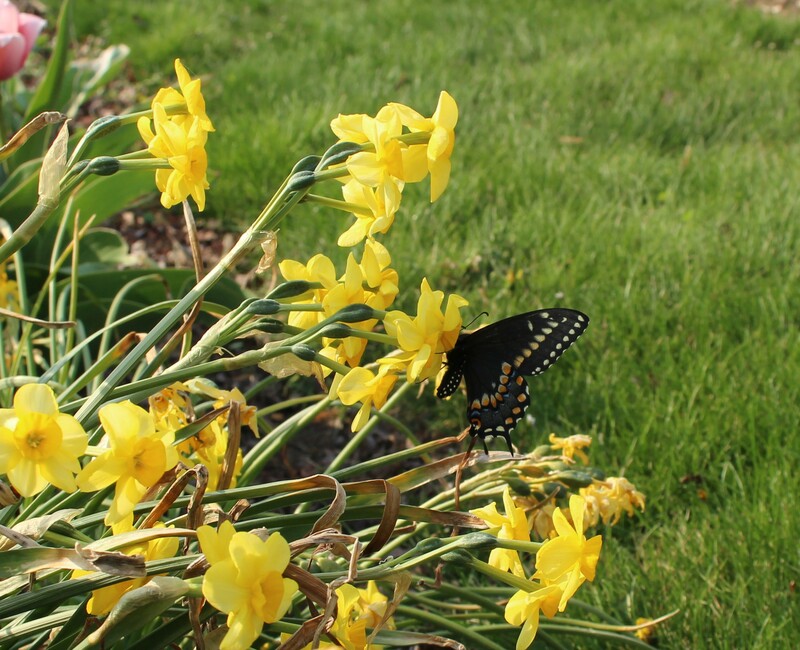 A black swallowtail feeding off the windblown and weather-beaten flowers of narcissus ‘kokopelli’. I hope my wallowing in self pity hasn’t made it seem like all is lost in my end of the woods. Spring is a fantastic relief even with its frequent ups and downs and if one looks past the blackened cherries and mushy primrose blooms and perennial shoots there’s still more good than sad. Later is better this spring, and because a late replanting last fall set daffodil ‘Newcomer’ back a few days, its blooms missed the worst of the weather. The tulips as well, the shelter of the garden’s tiny boxwood hedge seems to have helped them avoid the full brunt of the winds. In the lee of the house the front garden missed the full force of the wind. Here if I ignore all the mushy, blackened hyacinth blooms, and wilted early daffodils I can still find plenty to enjoy. 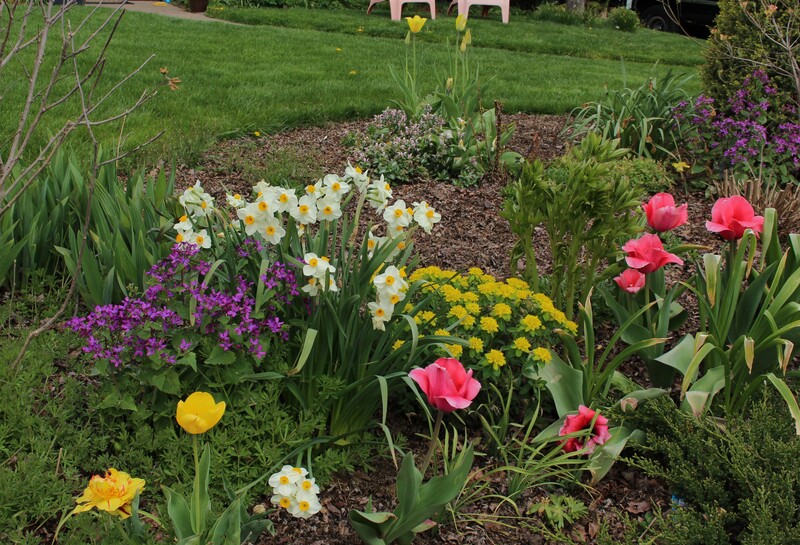 Blooms of the good old reliable daffodil ‘geranium’ set off by ‘pink impression’ tulips, yellow Euphorbia polychrome, and the purple flowers of ‘Rosemary Verey’ Lunaria annua (moneyplant). I was hoping for darker foliage on the Lunaria but maybe having all the old leaves frozen off a few weeks ago left me with only fresh new green ones. Finally! After several failed attempts and then a three year wait for my only sprouted seedling to grow up, the first Virginia bluebell (Mertensia Virginica) is in bloom. Others claim it to be nearly weedy in its ways, but I managed to kill the first one I bought and then never found it in the garden center again. I’m kidding of course. Although I do need to find new homes for many of the most promiscuous daffodils (please let me know if you can take any in), there are billions of new plants on the way regardless, as seeds sown last fall and winter begin to sprout. I always love these new surprises as much as I love the warmer up sides to this spring’s manic mood swings. Even a bright yellow dandelion makes me grin when the sun is out! 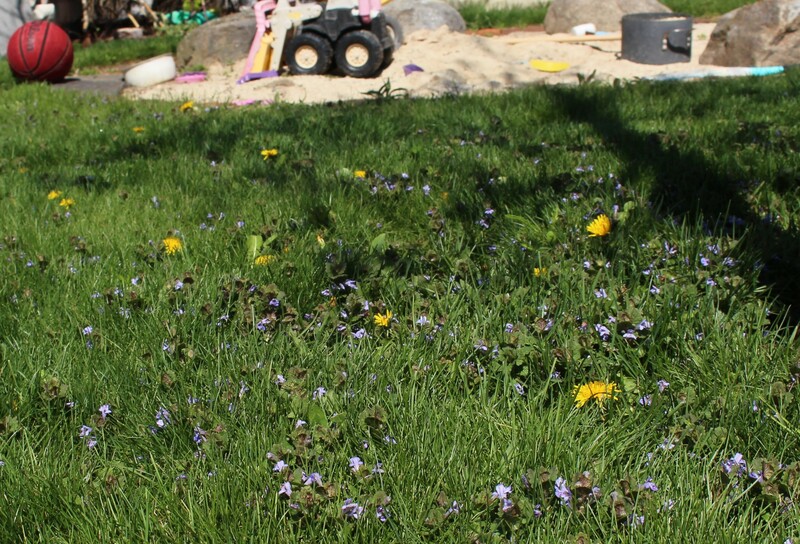 Creeping Charlie and dandelions on a sunny day. A beautiful lawn in my opinion…. even if Charlie does get on my nerves later in the season. This entry was posted in daffodils, early spring, freeze damage, mid spring, spring bulbs and tagged daffodils, garden, late freeze, spring, spring bulbs. Times they are a-getting better. It looks like your garden has held up well. At least the cool weather has been excellent for transplanting and grass growing. The lawn is absolutely lush again now that the bleached and browned leaf tips have had a chance to grow out. I think we are allowed to moan about the weather this year – as every year really! Here we had such warm T-shirt and flip-flop weather early April, and then last week an icy polar wind caught us and the fruit blossom out. This weekend we are back in the 20s (Celsius!) and soon we will be begging for rain! The daffodils that made it through are quite lovely and if I lived a bit nearer I would gladly take some off your hands. I hope your tulips recover. The tulips have been wonderful here, despite some hard frosts. The latest ones will no doubt feauture in another vase again soon! Let’s hope the weather is finally calming down a bit and the plants can breathe out and stretch without any fear of frosts! Yes I think your weather has mirrored ours this spring. We also had a wonderful spell followed by a harsh flashback to winter, and I for one am ready for continuing the wonderful spells! Disappointing when the cold catches the garden favorites off-guard like that but you still have some great things to be excited about. Your Virginia bluebell is wonderful (I’ve not had luck with it). There’s always something new coming along, I think that’s what I like best about gardening! How nice to have a butterfly feeding on the daffodils! I’ve never seen that before. And your Virginia bluebells are knockouts. Well done! I don’t mind dandelions at all. (My wife feels differently.) Today I even saw a couple of finches snacking on dandelion seeds. I like the *idea* of a “freedom lawn” with various weeds mixed in, but here some of the more aggressive competitors (white clover, black medic) seem capable of overwhelming the grass and creating their own monocultures unless I take steps (herbicides, unfortunately) to rein them in. I do manage to maintain the garden beds mostly with just good old-fashioned hand-pulling and am trying to plant more and more groundcovers to exclude the weeds by denying them space. I’m eyeing a few new groundcovers as well since the weeding is getting out of hand and the mulching is like trying to put out a forest fire with teacups. I spent a while last week watching the finches eating dandelion seeds. I don’t mind the dandelions at all but I’m sure my neighbors (and my wife as well) judge me for that sin. I’m so glad to hear your tulips made it to blooming this year, last year’s losses were disgusting and it did not reflect well on the cat’s work ethic. Bunnies have been my nemesis this year, thankfully no groundhogs! Any trips planned to the valley? It’s transplanting season you know…. That Virginia bluebell is truly fabulous. It’s sad when the season makes us ‘skip’ a flower that we’ve been waiting for … but there is always next year! (I’m less philosophical than I appear, believe me). The spring must get better! Hi Cathy, glad to see you’re finding time to get to the blog… my fingers are still crossed for your plumbing woes. Yes I also try to fake optimism (what other options are there?) but when you have to wait another entire year to see your daffodils again….. I do know what you mean – but they will be all the more precious when they come! If we can’t vent about the weather here, who are we going to vent to? I feel your pain. My daffy’s lasted a whole 2 days and then the pear blooms froze so no pears for me this year 😦 I gave up on tulips years ago. The pictures are lovely, though. Oh no, no pears!? It stinks that a single night can ruin an entire season’s harvest. But on the plus side congratulations on the second swarm! Last Monday’s high was 20 degrees above normal and the rest of the week was 20 below normal. The house is full of plants waiting for it to warm up enough for them to go outside. Ah, April! For us things look better so I’m hoping the same for you. You do have plenty of new goodies which need to be planted! Every time I think “this is it” I can get everything out of the greenhouse, another sub zero night appears on the forecast. But maybe this week, maybe. This Spring has been testing that’s for sure. Just a few days of warmth and sunshine will turn things right around quickly (including our moods). Please contain the excitement though, we don’t need yet another injury! I’m sorry to learn about your adverse weather. The flowers are a bit like ourselves, tearing the shirts off and pretending it’s summer and then sneezing and coughing afterwards. A lot of my trees and shrubs were once again attacked by winter moth caterpillars this spring. Some roses look poor and I’ve to tell myself ‘well, next year then…’ Only one thing worries me: how many more ‘next years’ are there? 😉 No point to though, let’s rather dance with the flowers that don’t let us down! Oh no, so unlike you to go the ‘how many more summers will there be’ route, but I think it’s only a temporary blip. A few new treasures into the ground, a few wine filled evenings on the patio, the perfect light and you’ll be in bliss again! It’s hard finding the time though isn’t it? Oh that’s too bad! I was shocked that most of my daffodils made it through our cold snap and bloomed like nothing had happened. I’m assuming it was thanks to the snow cover. I’ve never seen a butterfly nectar on a daffodil before! So interesting! I have yet to see a butterfly this year, unless you count that destructive white cabbage moth. Still early yet, I guess! Ooops. I kind of like those destructive cabbage moths 🙂 -but they do wear out their welcome on my delicate little broccoli seedlings! I think we may be in the clear snow-wise (finally). Looking outside this morning it doesn’t seem like that white weather was just a few weeks ago…. I’m surprised they were so affected. I thought they would have been impervious to the cold. Yeah, I thought for sure the daffs would stand up to any kind of cold…. I’m still a little annoyed with them for giving up. 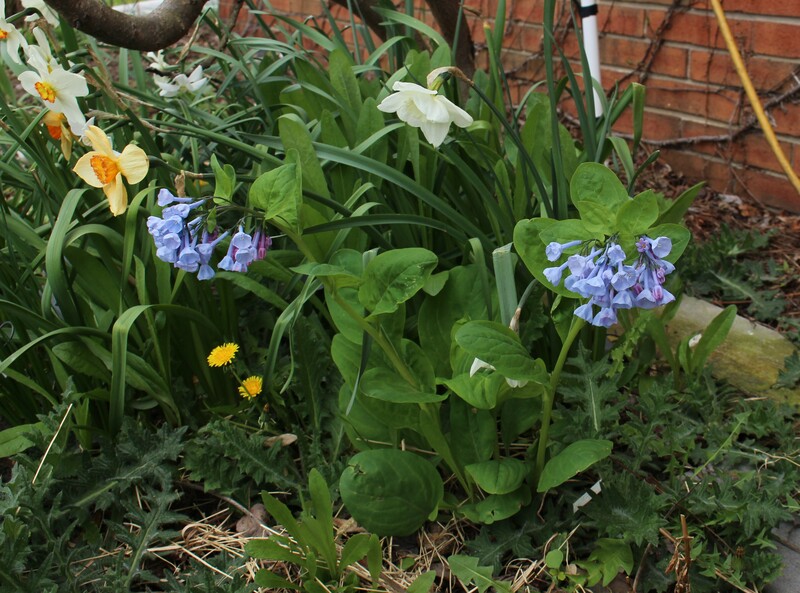 I am envious of your early butterflies (have seen zero here and probably won’t until the buddleia starts blooming) and your Mertensia, because I was given one two years ago, planted it, it bloomed the following spring, and then promptly disappeared into the underworld for good. Ah well, next garden. I have a forest of dandelion seedheads waving above my lawn within just a few days of mowing. The finches seem to enjoy it but I can almost feel my neighbors glaring at me! Even with all your losses you manage to grow far more daffodils than I do. I can see a lot to enjoy in your garden and that’s what it’s all about really isn’t it? The wind is still blowing hard here, I can’t remember a time when we’ve had strong winds for more than 5 days at once and this has been 2 weeks and there seems no sign of a let up, but I suppose it will just suddenly stop! Yes, in spite of the ups and downs there is always something new to look forward to. There’s always iris season, right? Glad to see your winds have died down finally. The tomatoes will appreciate some warm sunshine for a change! Wind is the thing I always hate, whether it’s hot or cold. It is very still and the sun has just come out as I write – perfect. 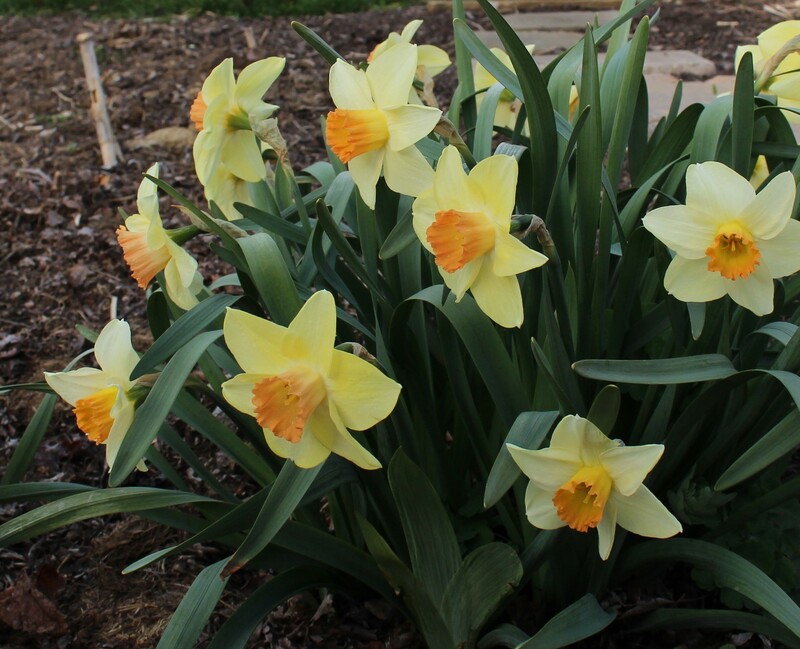 Many of my daffs met the same fate along with other plants especially flowering shrubs. I can’t take in any more daffs…sorry. I am dividing some this summer to add to other areas of the garden. 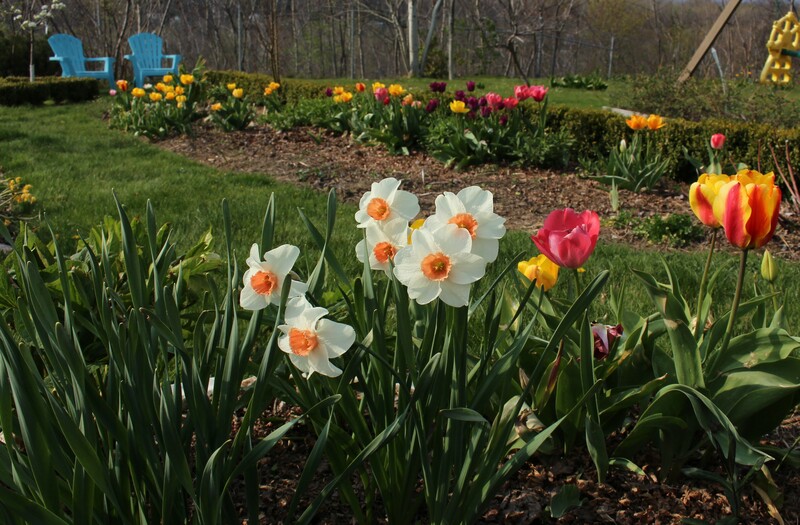 Many daffs did bloom, and still are blooming with others just flowering….I am shocked at how long they are lasting now with a cool May. I guess the cool weather is good for something, right? Here the daffodils are hit or miss for lasting now that the weather is a steady cool, but the remaining primrose blooms seem to be going on forever! They really seem to appreciate weather at the lower end of comfortable. No 80’s for them!